If you have any questions or want to enquire about dates, use our form to contact Juan Arizo or see their website for more information. The first house on the street was built by Juan’s great-grandparents, in Modernist style. Next they built this; and, as the family grew, they continued on down! Enter, through the original coach doors, a lofty light room furnished with elegant armchairs, breakfast tables and wood-burner, wafted with lavender; great-grandmama’s wedding tapestry decorates one wall, a dresser displays local products you can buy. Juan lives nearby, but when guests stay, he comes back here, to welcome you with warmth and generosity. As for the renovation, it is a captivating Valencian marriage of old and new. The three Modernist bedrooms are distinguished by their double entrance doors and decorative floors, but all the rooms are extremely fine, with beds of white-painted wrought-iron and polished mahogany, sprigs of rosemary topping fluffy towels, and walls and bedspreads snowy white. Front bedrooms have balconies and there is some coastal-road hum. After a simple but delicious breakfast in the courtyard, stroll along the Paseo Martimo to the popular beach, take a boat to the Islas Columbretes, or borrow bikes for the Via Verde. Wonderful. Evening Tapas €20. Restaurants within walking distance. Our visit at Casa Arizo was spectacular. The beautifully restored rooms are stylish and comfortable with excellent amenities. 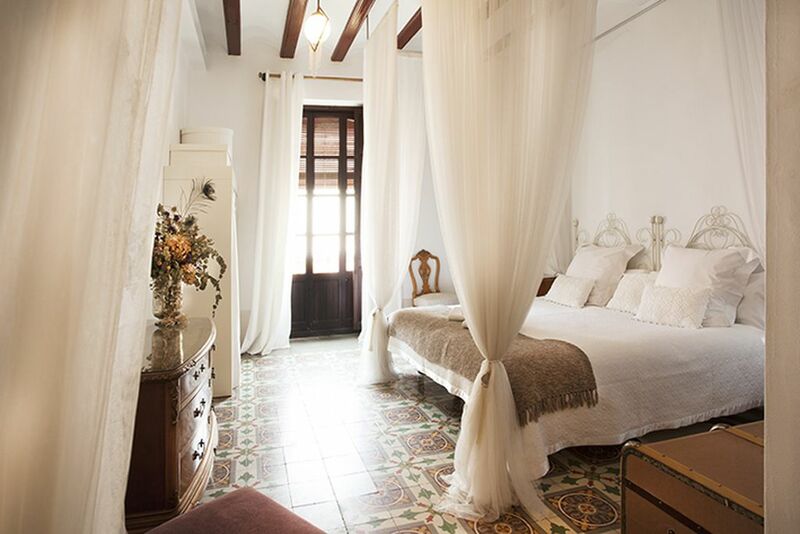 The hotel faciilities are excellent, modern but still retaining the charm of a traditional Valencian house. Juan and his staff were extremely attentive, helping us to arrange airport transfers and breakfast was superb. There are a variety of local gifts including food and jewellery on sale which are perfect as gifts or souvenirs. I throughly enjoyed my stay at Casa Arizo and hope to stay again soon. I highly recommend this as a relaxing stay in a beautiful hotel. A friend and I visited Casa Arizo in Orpesa out-of-season (late October) and had a fantastic stay in this beautifully preserved and restored old farm building. We met our host Juan and his sister in the early evening and being quiet were offered to pick our choice of room within the building. Juan presented us with some fantastic local produce including Valencian beers and local olives. We found the stay exceptionally comfortable, with immaculate fittings throughout the property. The owner Juan even organised a game of the local sport, Padel, for us prior to our departure! Outstanding. Join Casa Arizo for our Summer Festival celebrations! Flamenco Festival de Benicassim in July, Blues Music festival & Feria de la Cereza en Salsadella in June, don’t miss out! Call us for more information! More Festival: ROTOTOM & ORFIM Classic music Festival in August, Nits de musica in July and Festival de Guitarra Francisco Tárrega beginning of September. Juan can organise visits to local vineyards and orange groves, where you can even join in with harvesting Local beer and wine tastings. Guided tours of orange orchards, vineyards and olive orchards. Visit to natural park “Desierto de las Palmas” and “Islas Columbretes”. The house was originally built for the Arizo family, and although Juan and his sister Asuncion do not live on-site they are very hands on hosts and are readily available for problem solving and guidance.